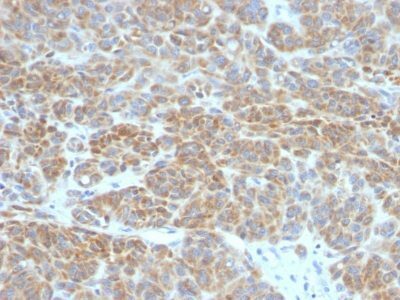 This antibody recognizes a protein of 25-26 kDa, identified as the bcl-2 α oncoprotein. Jurkat, K562, HL-60, or HeLa Cells. Tonsil or follicular lymphomas. 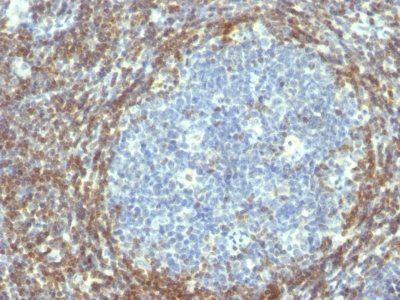 This antibody recognizes a protein of 25-26 kDa, identified as the bcl-2 α oncoprotein. It shows no cross-reaction with Bcl-x or Bax protein. Expression of bcl-2 α oncoprotein inhibits the programmed cell death (apoptosis). In most follicular lymphomas, neoplastic germinal centers express high levels of bcl-2 α protein, whereas the normal or hyperplastic germinal centers are negative. Consequently, this antibody is valuable when distinguishing between reactive and neoplastic follicular proliferation in lymph node biopsies. It may also be used in distinguishing between those follicular lymphomas that express bcl-2 protein and the small number in which the neoplastic cells are bcl-2 negative. Catalog number key for antibody number 0782, Anti-Bcl-2 (BCL2/782) The prefix indicates conjugation, followed by the antibody number and size suffix.